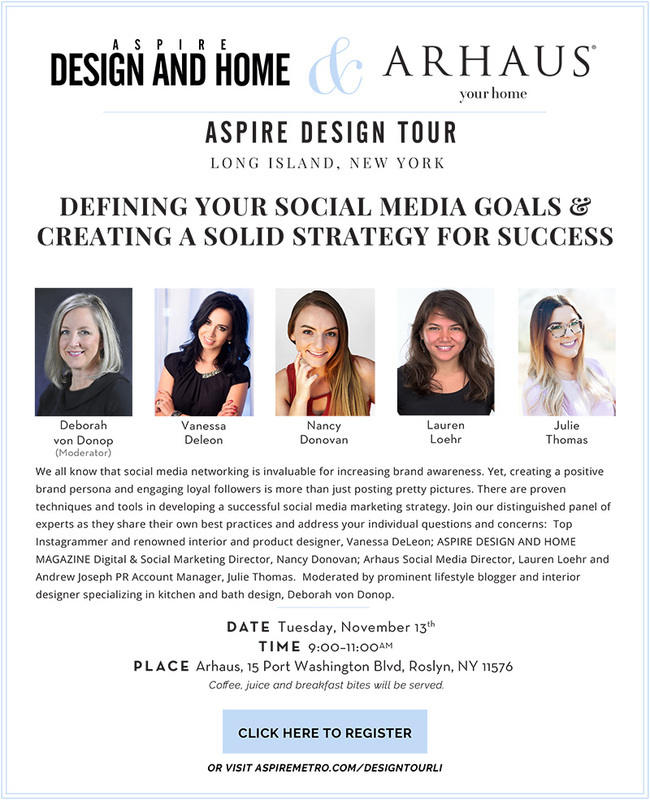 Meet Aspire Magazine's Social Media and Digital Director, Nancy Donovan, VP of Arhaus Digital and Social Media, Lauren Loher, and Andrew Joseph PR Account director Julie Thomas, Along with Celebrity Designer Vanessa Deleon of VDA Designs. We will be sharing tips and strategies on creating a social brand presence for your business. This is an informative panel and the best part? It's FREE. Designers and Bloggers sharing strategies to improve your business and build your brand story through social media. Defining Your Social Media Goals & Creating A Solid Strategy For Success: Full LIVE video here. Social Media is a key part of any marketing plan for an Interior Design business. I coach a lot of Interior Designers and Retailers who want to grow their business but are stuck on how to become visible to their ideal clients. Everyone knows that social media is a great way to connect with brands, each other and possible provide a community of like-minded people, but many feel funny about promoting themselves, and their work. A lot of people feel funny promoting themselves. I hope to point out that designers encounter many interesting tidbits of resources, information or highlights in our industry that are actually VERY interesting. Growing your social media presence will only help you grow your business. Touchless faucets, talking fridges, and countertop charging stations are no longer a futuristic fantasy. Whether designing a new kitchen or renovation an existing one, its essential for designers to stay up on emerging technology and design trends. Now that millennials have entered into the ranks of home ownership, three generations are impacting kitchen design. Each age group looks to different styles and amenities to meet their taste and needs. How do online magazines and blogs discover their content? Some come from the minds of the magazine writers and bloggers. But a great deal of content is collected directly from designers like you. How to pitch your own ideas and put your business just a click away from prospective clients and consumers. This distinguished panel with share insider secrets and best practices to getting your work published. I know, it all seems too overwhelming! Find out how you can become visible and share your own personal voice to reach your ideal client and community. Are you ready to become "noticed as a resource" in your area?